Take yourself to the river. "Land Down Under" plays softly over the Front Street Deli sandwich board that implores passersby to "Rise & Shine!" with a biscuit, croissant, or toast. Just down the bluff, a retirement-home bus idles in front of the Memphis Tourism office on Union, its driver chatting with a Blue Suede Brigade member. Through the shadows of the bluff and its buildings, the Wolf River Harbor spreads brightly — a brown and sky-blue expanse punctuated with the gleaming whites and reds of river boats and their big paddle wheels. Cars, rigs, and vans slide silently in the background across the Hernando DeSoto Bridge. Shirtless runners pad across Riverside at the stoplight, passing a group of bundled-up guys on Birds. An older couple uses their hands as visors against the glare to read historic markers and take in the whole scene — from the shiny point of Bass Pro Shops at the Pyramid to the north to the tiny Harahan Bridge at the south. Then there's the Mississippi River, flat and wide, churning slowly to the sea, seeming to simmer more than it flows. Mighty and muddy, the Mississippi River made Memphis. But what will Memphis make of the river has been a long-unanswered question. It's one we've studied a lot. Lordy, how we've studied. Plans have come and gone since 1924, at least a dozen in the last 25 years. Elected officials, business leaders, and civic-minded citizens have all tried. Some have had some success. The $63 million Mud Island River Park opened in 1982. The $43 million (and much-criticized) Beale Street Landing opened in 2014. All have had challenges, many of which still remain. But there's a new energy in the air. The Riverfront Development Corp. (RDC) hired Studio Gang, an internationally known design firm, to form a plan in 2016. In 2017, Memphis Mayor Jim Strickland formed a task force to focus on riverfront change. 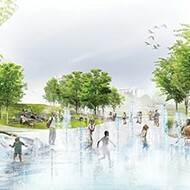 Last year, Studio Gang delivered its ambitious Memphis Riverfront Concept Plan, which imagined a waterfront connected with parks, markets, museums, and more. 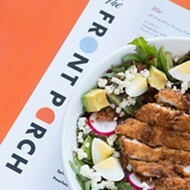 Then, earlier this year, a new group took the riverfront's reins. 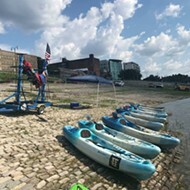 The Memphis River Parks Partnership (MRPP) took over for the Riverfront Development Corporation (RDC), which had managed the riverfront for more than a decade. With the concept plan in hand and MRPP at the helm, the buzz about the river got loud. Its new leader, Kresge Foundation fellow Carol Coletta, had big ideas and the connections, motivation, and know-how to push them forward. Within months, things were changing. Look no further than the brand new River Garden park and River Line trail system that opened on Friday. We talked with a few folks with front seats to riverfront activity. Portions of those interviews are below. Kate Orff (SCAPE), Carol Coletta (Memphis River Parks Partnership), Gia Biagi (Studio Gang), and Jeanne Gang (Studio Gang), [from left to right], usher in an ambitious new look for the Memphis riverfront. 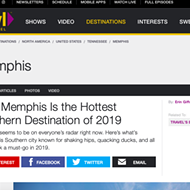 Memphis Flyer: Memphis has been planning for its riverfront for a long time. Carol Coletta: The first riverfront plan that Memphis did was in 1924. You can say, gosh, Memphians have had a vision for their riverfront for almost 100 years. I mean almost 100 years ago, Memphians thought, I have a great riverfront. While we've done bits and pieces along the way, I think no one would say, we have one of the world's great riverfronts. I think we would say, we have one of the world's great rivers but not riverfront. So, now I think the community has come together in a way that will — I believe — allow us to make good on that promise that people saw almost 100 years ago. This year, we've made a series of important steps to realize that ambition. The city granted us a 13-year management agreement to manage the 250 acres of riverfront that are owned by the citizens of Memphis, a 13-year agreement with a 10-year extension. That was important. We completed the concept plan in 2017. But instead of a plan that sits on a shelf, which is what everyone fusses about, and rightly so, we've taken a very quick start on the [capital funding] thanks to national funders, including the Kresge Foundation and the JPB Foundation. 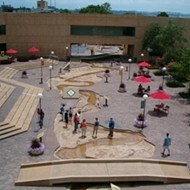 We were able to start and complete River Garden on what is now called Mississippi River Park. It's a beautiful river garden. In fact, everyone we've shown it to in a sneak-peek situation said, I can't believe this is what our riverfront looks like. Also, the city is committed to getting the cobblestones underway — a restoration of those five blocks of cobblestones — in January. We're doing a very quick start on design for Tom Lee Park, from the bluff to the water, from Carolina Street all the way to Beale. If all goes well, we can raise the money that we need, start construction in June, and our estimated schedule calls for completion in December 2020. If you put River Garden, cobblestones, and Tom Lee Park together, we have a chance — I think unparalleled in the U.S., maybe in the world — to remake the heart of Downtown and the narrative for our city by doing those projects on our riverfront. We need to make sure this time that we joined it up north to south, that we join it east to west and west to east, that's our challenge. Make great places to be on the riverfront but also make sure it's all joined up. Why was the change needed from the RDC to the MRPP? 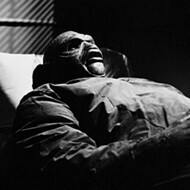 One was [former RDC leader] Benny Lendermon's retirement. He'd been here, I think, 17 years and ... if you look at the riverfront today you would have to credit Benny with a number of [projects], like the Bluff Walk, the cobblestone walkway, and even the city's foresight ... in creating this big Tom Lee Park. There were important moves that had been made over the 17 years and certainly maintaining the parks is no easy feat. But I think there was, with a completion of the Riverfront Concept, excessive excitement and possibility. I think the board wanted to put the organization in high gear. Memphians want and deserve a great riverfront, and we're missing this great opportunity that goes way beyond the riverfront, way beyond Downtown. It extends to the city and even the region in terms of the narrative: how Memphis is viewed by the people coming into the city, going out of the city, investors, and prospects, and just Memphians. We don't need to settle for a second-class riverfront. Adding to the riverfront — the just-completed River Garden infuses new life to the recently rebranded Mississippi River Park. A statement from your organization earlier this year mentioned a new business model for MRPP. We re-thought pricing. We re-thought relationships. We started with the belief that we manage this organization with and for the people of Memphis to trigger the transformative power of the river. We always try to start with the belief that we're stewards of these parks for the people of Memphis, who own these parks. Making this riverfront all it should be, can be, and Memphians want it to be, is really a great act of democracy. It's also in philanthropy, and generous corporations, and individuals who will help us get there. Let's talk about the new, $70-million capital campaign. Where did you start? Where are we now? We are in the phase of calling on prospective donors. But early on, the city proposed to the state that the riverfront would be a focus of some of the [Tourism Development Zone] funds. They felt like development on the river would generate sales taxes that would fund the TDZ. So, we were fortunate to get some early money to get design underway. But we're going to have some major announcements on funders coming up very shortly. The Hyde Family Foundation has made a $5.2 million commitment. We're just thrilled to have that foundation's support and we've got some more commitments to be announced soon. You invited consultants here over the summer to have a look at Mud Island. Did we ever hear back from them? Yes, we did. I can't talk about the plans for Mud Island yet. But I can tell you that we've got some really exciting things cooking that come directly from that visit. We know that Memphians are uneasy about Mud Island. It's sitting out there. ... But what should it be? There are all those legitimate questions. We think we have a way forward on Mud Island that will activate it, animate it in a way that Memphians will kind of fall in love with. Any idea when we might hear something? I think it could very much be a next-season kind-of-thing. We're working on it. Talk about River Line and the connections it'll make. 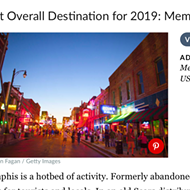 One of the beautiful things about Memphis in the last few years is that we really have begun to understand the power of connection. 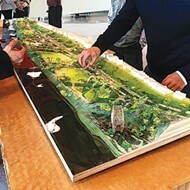 Connection was one of the major themes, major valued things, of the Riverfront Concept. It's a critical missing piece of our trail system that we've invested in. This will make Wolf River Greenway Trail that much more valuable. It will make Big River Crossing and Big River Trail that much more valuable. River Line connects Downtown from the north end to the south end. That's never been done with any sort of decent pedestrian [walkways], and certainly not with biking trails. Then to think about connecting it all to South Memphis where South Memphians now have an easy safe way to get from their neighborhood up to Big River Crossing and into Downtown. It will have a spectacular impact. Imagine riding a bike from Germantown to New Orleans. If planners have their way, you'll be able to do it in the future. Wolf River Conservancy and city leaders are pushing to complete the nearly 26-mile Wolf River Greenway Trail (stretching from Germantown to the River Line Downtown) by 2021. Across the river, leaders in West Memphis have completed bike trails that connect to Big River Crossing and are working to do more. Big River Trail will now take you south to Marianna, Arkansas. But those leading the project want cyclists to one day be able to ride Mississippi levee trail all the way to the Gulf of Mexico. We spoke with Keith Cole, executive director of the Wolf River Conservancy, and Paul Luker, director of planning and development for West Memphis. What do you make of River Line and the Wolf River Greenway Trail? Keith Cole: It's going to be a game-changer for the city. All of these projects are designed to connect people and communities. As we do that, we'll provide new access and provide potentially new economic activity that people might not have thought about or done before without these access points. How does the connectivity with River Line and Downtown affect the Greenway? The more connectivity and the more access you can have, it should provide more users. Let's say you live in the South Main district of Downtown. Before the opening of the River Line, you could — if you knew what you were doing — ride from South End and go all the way to Harbor Town. Certain areas were a little rocky and not safe. But now, that's improved. So, you create these new avenues and new connectivities from these different projects ... more accessibility should create more users. How will River Line affect West Memphis? Paul Luker: I think they're complementary. River Line will make it easier for the larger population concentration of Memphis to easily access what we're calling our River Park. Right now, it's just some trails with the idea that we're going to keep working on it. We'll be adding trails but, also, with some land acquisition, it'll allow us to have some larger events and stage some things and offer more variety to go beyond biking and trail walking. What else are you doing in this area? We want to continue to play off of Big River Crossing. It's a catalytic project. The city of West Memphis has always looked at the Mississippi River and tried to think of how they could take advantage of that asset. The thing that has always come to mind is having a park there. Well, Arkansas State Parks already has a lot of parks. We were never really able to sell them on the idea of another state park there. But when Big River Crossing came around, that reignited the enthusiasm for trying to develop something park-like on the river. How has Big River Crossing affected West Memphis? It's still in its infancy as to what it'll give to West Memphis. But right now it's given us recognition that we have something on this side of the river, that we have an attraction. Pancho's restaurant, which is at the trailhead of Big River Crossing, they've seen a big uptick in their business related to bike traffic. That's one tangible impact. It's like a lot of projects — you have to prove that it's really going to get used before people will risk their money. We're still waiting for the full impact of what can be seen from Big River Crossing as far as how it's affecting West Memphis. It's at least changed the conversation when you bring up West Memphis/Crittenden County. What are the broad opportunities and challenges with Tom Lee Park? Gia Biagi: We are energized [by] the potential of Tom Lee Park to strengthen the relationship between Memphians and their Mississippi River waterfront. 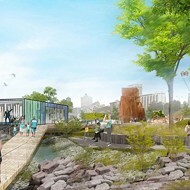 We are excited to help Tom Lee Park reach its full civic potential ... by delivering a revitalized park that is inviting, inspiring, and helping to better connect Memphians to the riverfront and to each other. We've heard a lot about transforming the park with outdoor "rooms." What can we expect at the park? 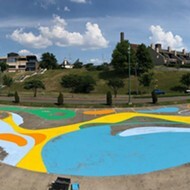 Our goal for the urban design of the park is to create a variety of experiential spaces that will transform what is now a flat surface into a diverse landscape that is more accessible, welcoming, and can be active 365 days a year. We are working with our partner, landscape architect SCAPE Studio, to develop a landscape of micro-forests and large clearings to come together with architectural structures, outdoor learning spaces, and activity courts. How have the discussions with Memphis in May gone? 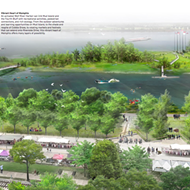 What can festival-goers expect in a re-designed Tom Lee Park? Over the last two years, we have collaboratively worked with Memphis in May to explore ways that the park design can also benefit festival-goers. We have worked closely with Memphis in May and other key stakeholders to arrive at a design for the park that will also improve the logistics of large events. We have been discussing how areas of hardscape and other structures can be used as stages, food tents, access, and loading. 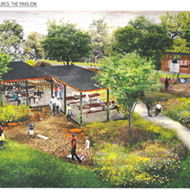 We're working toward improvements that make for a vibrant, signature civic space that can accommodate all kinds of events and even reduce overhead and operating costs for both the Memphis River Parks Partnership and Memphis in May. 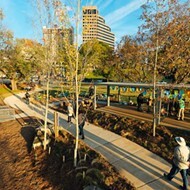 How will the redesign better connect Tom Lee Park with the rest of Downtown? We're working on gateways and crossings that make it safe, easy, and enjoyable for walkers, bikers — even scooter-riders — to get to the park from Downtown and nearby neighborhoods, as well as connections to transportation nodes for people visiting from further away.